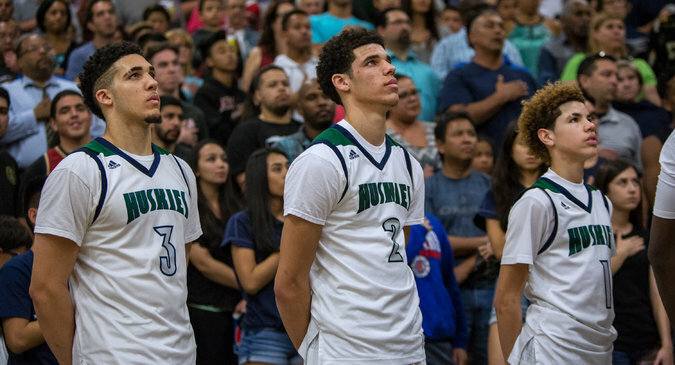 The Ball brothers, LiAngelo, left, a 6-foot-5 junior; Lonzo, a 6-6 senior; and LaMelo, a 5-10 freshman play for a team that averages 99.6 points a game. CHINO HILLS, Calif. — The best high school boys’ basketball team in the country scores at a video-game clip of 99.6 points per outing, and it does not wait around to see if opponents can keep up. During a holiday tournament in December, it beat an opponent from Milwaukee by scoring 125 points. The next night, it poured in 124 against a challenger from metro Atlanta. But numbers are only part of the remarkable story of this season’s Chino Hills Huskies.